Sorry to inform you that..... Change is coming. Don't you just want to scream when you go to write the new blog and blogger has followed the path of facebook and CHANGES everything or tells you to "get ready for the change, because the 'old format' is going to dissolve." If you were comfortable with how things were,tough,you have to enter the next grade and that's just how it is. The Universe is always pushing the light toward the next step on the ladder. And we don't want to be in the dark (or do we?) so UP we must strive for. The full moon is coming,(May 5th) and that's going to start the "who has and who hasn't" got enough battle. As that is happening, the bickering will also begin in what is "fair" and what is worth going to WAR over. This dialogue will all take place in your head. Mercury is in Aries still. Aries rules the head. The words will gather steam, and the volcano of fire will find itself outside your head, and in the path of whatever you deem worth fighting for or about. IF you are one to hide from conflict give yourself a big problem to solve that has a reward at the end. Such as making soap from scratch, studying for the Bar,(law not drinking),trying to get a new law on the ballot, and or anything that requires lots of mental effort. I don't mean to sound like a drip, but the first 3 weeks of May are going to be fire and fighting. And then the Solar eclipse comes a calling .........get ready to rock and roll and words are all part of it. WHATEVER you do ~~~ DO NOT GET MARRIED NOW!~~~~~ Venus goes retrograde and will stay in that back-peddle mode for six weeks. The dates are- May 15th- June 28th. IF you start a relationship now, its going to look VERY different in July. If you break up now, you'll likely miss each other and try again later. Its all about everything 'looking better' on the other side - until you get to the other side, and then the side you left looks better. So if you don't want to be a yo-yo, just make no major commitments for a couple of months. CHILL. Learn to communicate better. That means- listening as well as talking. 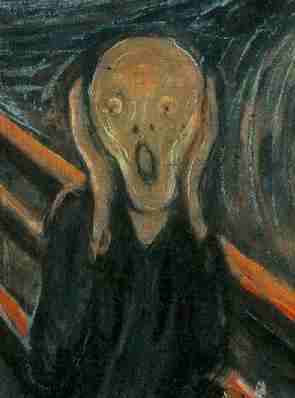 Silence isn't a form of healthy communication unless your refraining from "THE SCREAM". Babies scream, and they either get what they want, or they keep screaming. No one likes this. Not even them. But they haven't yet learned how to not scream, so we forgive them. Well, some people do. Try to learn a new way of speaking. And listening. That's far more productive, even when you feel like screaming at the computer or a person. It's all about communication in May. Starting at zero. The solar eclipse happens on May 20th at the zero degree of Gemini. So----- its about entering into a new way of giving and receiving information. (Hence blogger.com wanting to "change" format!). Where 0 degrees falls in your astro map is where you'll be CHALLENGED to speak up and not fall off the stage. Some will fall. Some will LEAP into the orchestra pit and cause all kinds of mishap. Some will come up with a great writing idea. Some great authors will cross over and everyone will be shocked. Hopefully people will start reading more. Books will become 'important' once again. AND..... what you 'aren't' suppose to read as well. The conversations about how the government can't 'afford' to keep places of community learning open will continue. Support your local library before they think of closing them down too! And yes, the Post Office isn't out of hot water... but they just might get a life-line after all. If we SCREAM loud enough! We will be hearing more and more how much "communication" cost. Computer viruses will be abound in May. Be prepared- BACK-UP! Jupiter will spend the last five weeks of its journey through Taurus. It won't return there for twelve years. So Taurus sun people- just remember that lady luck is leaving you very very soon,(June 12th) and she's headed to the double-fun sign of Gemini...Don't you just want to scream with sadness? ..........like I said "things are changing."